Were the Victorians really as apathetic and drippy as these paintings suggest? Dear, good, kind, sacrificing Little Nell. Here she is kneeling by a wayside pond, bonnet pushed back, shoes and stockings off, while she rests her blistered feet. She scoops a palm of water with cupped hands and tenderly washes those of her grandfather: her feckless, gambling, on-the-lam grandfather. It is an old Oscar Wilde chestnut, but one would have to have a heart of stone to look at William Holman Hunt’s portrait of Charles Dickens’s saintly ‘Little Nell and her Grandfather’ (1845) without laughing. Likewise Arthur Hughes’s ‘The Woodman’s Child’ (1860), a portrait of a tousle-haired country mite sleeping in the woods, attended by a squirrel and robin, their red coat and breast so sweetly matching her own little ruby socks. Bambi, one imagines, is waiting to gambol into frame. The Pre-Raphaelites assembled for the Liverpool Walker Gallery’s Pre-Raphaelites: Beauty and Rebellion show do lay the pathos on thick. Titles are twee, treacly or tearful: Daniel Alexander Williamson’s ‘The Startled Rabbit’ (1862); James Campbell’s ‘Twilight — Trudging Homeward’ (1857) and ‘Waiting for Legal Advice’ (1857); John Ingle Lee’s ‘Sweethearts and Wives’ (1860). Faced with all this Little Nellery, you thrill to the vampish Lady of the Lake in Edward Burne-Jones’s ‘The Beguiling of Merlin’ (1872–7). In clingy, pleated violet and lavender silk she is very beguiling indeed. Looking at Merlin, though, you wonder why she bothers. Lounging on a blossom bough, one hand dangling above a pool of irises, gold-sandalled ankles crossed, he is as drippy as Eddie Redmayne’s Danish girl. Too many of the paintings collected here share Merlin’s languid lack of energy. There’s no vim, no vigour, no get up and go. 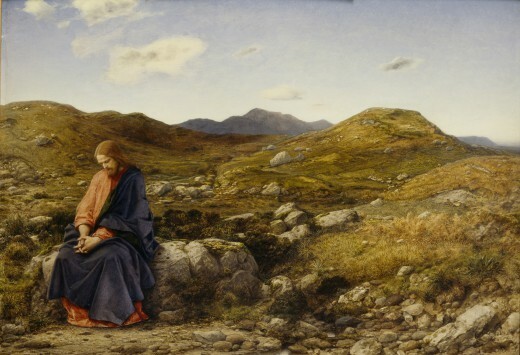 The Christ in William Dyce’s ‘Man of Sorrows’ (c.1859) doesn’t suffer the agony of his Passion wounds — compare him with Albrecht Dürer’s hunched, head-in-hands, nail-pierced and thorn-pricked ‘Man of Sorrows’ — but peacefully catches his breath on a rock while walking the Scottish Highlands. The model in Arthur Hughes’s ‘In the Grass’ (c.1864) lies supine, ‘caressing her breast with a bluebell’. William Holman Hunt’s model in ‘Il Dolce Far Niente’ (1859–66) — the sweetness of doing nothing — slumps apathetically in her chair. Rae and his wife were just two of the busily effective Liverpool patrons who bought and encouraged the Pre-Raphaelites — and opened their homes to those who wished to see the paintings. The Walker Gallery exhibition is arranged around these Merseyside patrons: John Miller (whose fortune came from cotton, timber and tobacco); Frederick Richards Leyland (steamships); Humphrey Roberts (timber, the docks); George Holt (shipping, maritime insurance); and William Hesketh Lever (soap powder). Hanging the show on these far-sighted Liverpool patrons gives intelligent purpose to an exhibition that might otherwise run the risk of being just another outing of the Pre-Raphs. While one admires their enterprise and energy, one questions their taste. What possessed Lever to buy William Holman Hunt’s lurid ‘May Morning on Magdalen Tower’ (1890) with its candyfloss sky, dewy choristers and gothic columns carved from Brighton rock? Perhaps he admired the choirboys’ Lever-soap-powder-white surplices. Another of Holman Hunt’s Liverpool successes was ‘The Finding of the Saviour in the Temple’ (1862), bought by George Holt. While the temple is lavishly done — somewhere between a souk and a seraglio — the moneylenders are a lacklustre bunch and the Christ-child a preening upstart, making eyes at the painter and ignoring his mother. Compare him with the wonderfully truculent Christ in the Simone Martini painting ‘Christ Discovered in the Temple’ (1342) that opens the exhibition. The Sienese master is included to illustrate what it was that the Pre-Raphaelites admired in art before Raphael: decorative surfaces, richness of colour, gorgeous drapery. Martini’s Christ is a surly, scowling, thwarted teenager, furious to have been returned to his parents when he was just hitting his stride. There is more energy and conviction in this sulking figure than in all the balletic, tunic-and-tight-wearing heroes of Burne-Jones, Holman Hunt, Millais, Rossetti and the rest of the Pre-Raphaelite brothers.